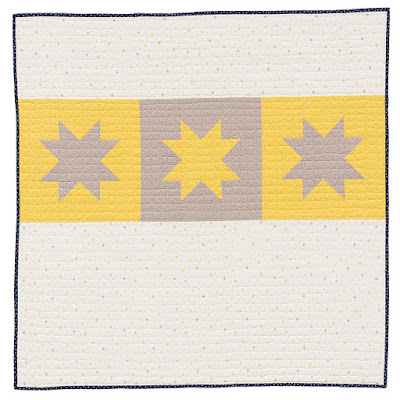 Happy Quilting: Baby Quilts for Beginners - 2 New Quilts!!! EEEkkk, it's another one of those secret sewing project reveal days!! I just love being able to share these quilts that I have had to keep a secret for what seems like forever. So let's not wait a minute more and get right to sharing the quilts!!! and this is Time to Shine. And I just love how cute and adorable they both are!!!! 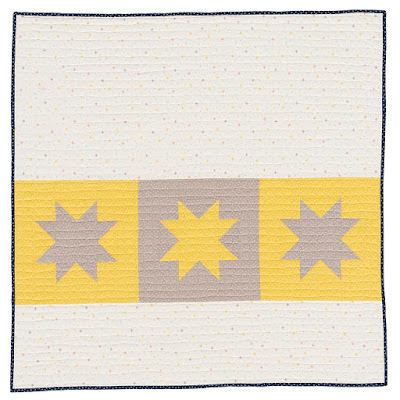 I made these two quilts last July for the newly released Baby Quilts for Beginners book and I have been so excited to see all the adorable quilts ever since then. I just love making baby quilts!!! I can't help but smile when I think of a sweet little angel being wrapped up in all that quilty goodness. And this book is jam packed with 14 adorable quilts that are perfect for beginners to learn on, but also perfect for those who have a little more experience, but need a fast "go-to" gift. Most of these quilts be made up in a day!!! 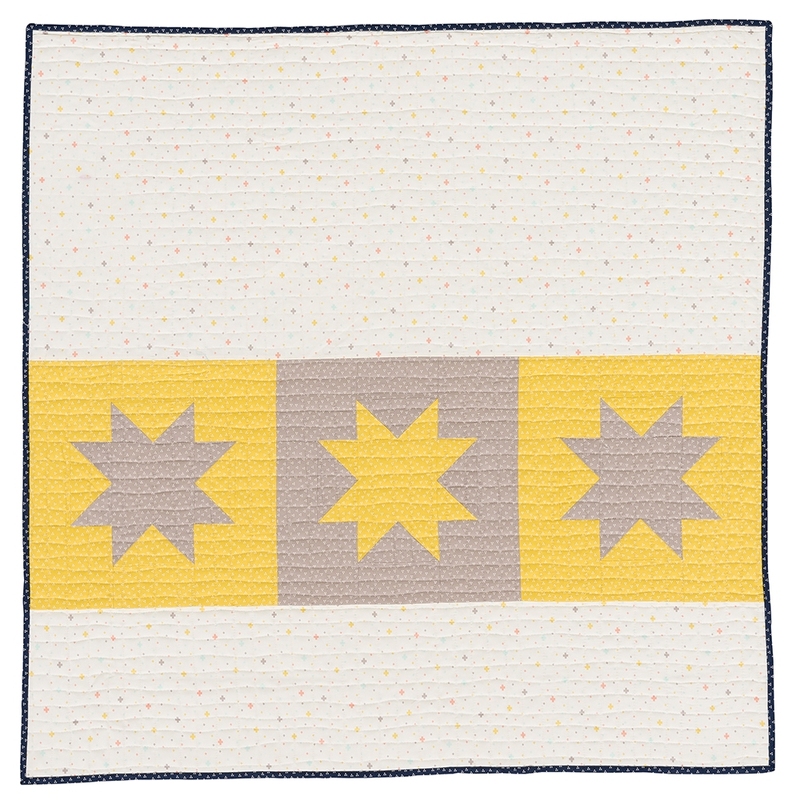 So let me tell you a bit about my two quilts found in Baby Quilts for Beginners. First up is Labyrinth. When we were asked to submit ideas for baby quilts that would be suitable for a beginner, I immediately thought of Jelly Rolls. They are just so great to learn with as they mostly involve strip piecing. So I came up with this fun Maze design that gives lots of movement, but is really just an easy strip pieced block that has been rotated. So fun!!! 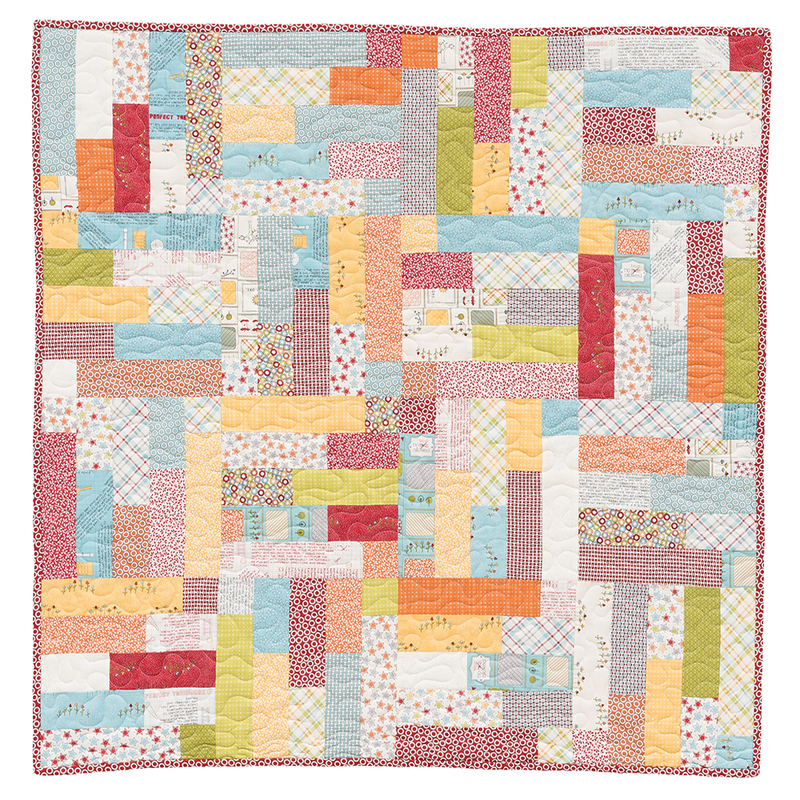 Since this book is all about Beginner quilts, the quilting is focused on beginner friendly designs as well. And what better place to start with quilting than a simple meandering or stippling, whichever you prefer to call it :) I kept the size of the meander to a medium so it is still nice and soft for snuggling but at the same time adds lots of yummy texture. 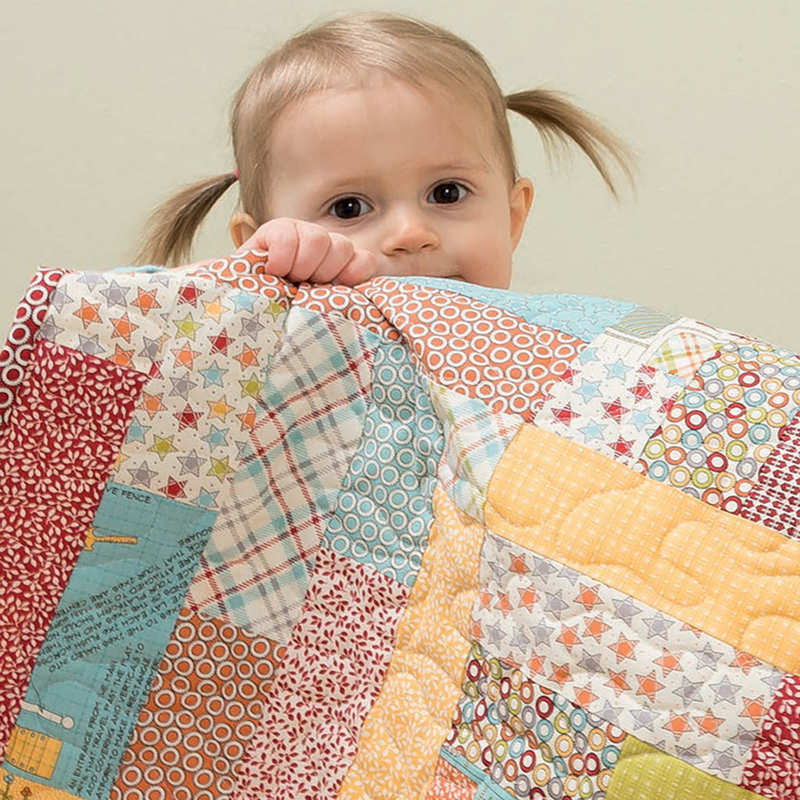 And speaking of soft and snuggly, how adorable is this picture from Baby Quilts for Beginners!!! 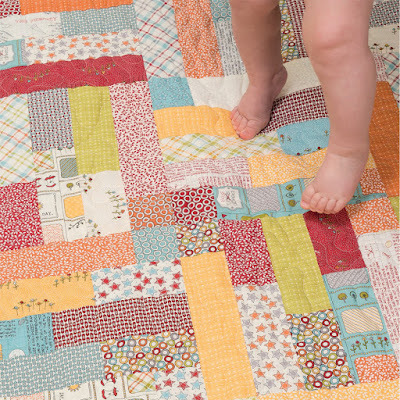 I just love little baby toes, and this picture had me all excited for the quilt to return and to gift to a special little one!!! And that is Labyrinth ;) It measures 40" x 40" and it oh so much fun to make. It's just perfect for beginners to learn on, and wonderful for experienced quilters that want a fast and fun finish. 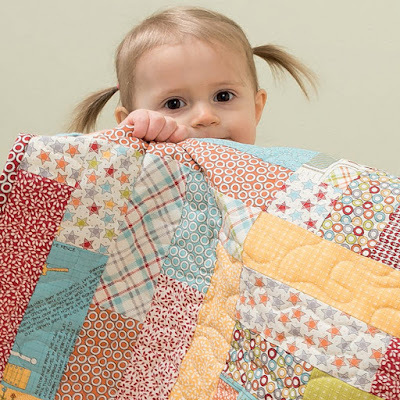 I hope you just love it as much as I do ;) And of course, I just had to share this picture from Baby Quilts for Beginners as well, because that little girl is just precious!!! 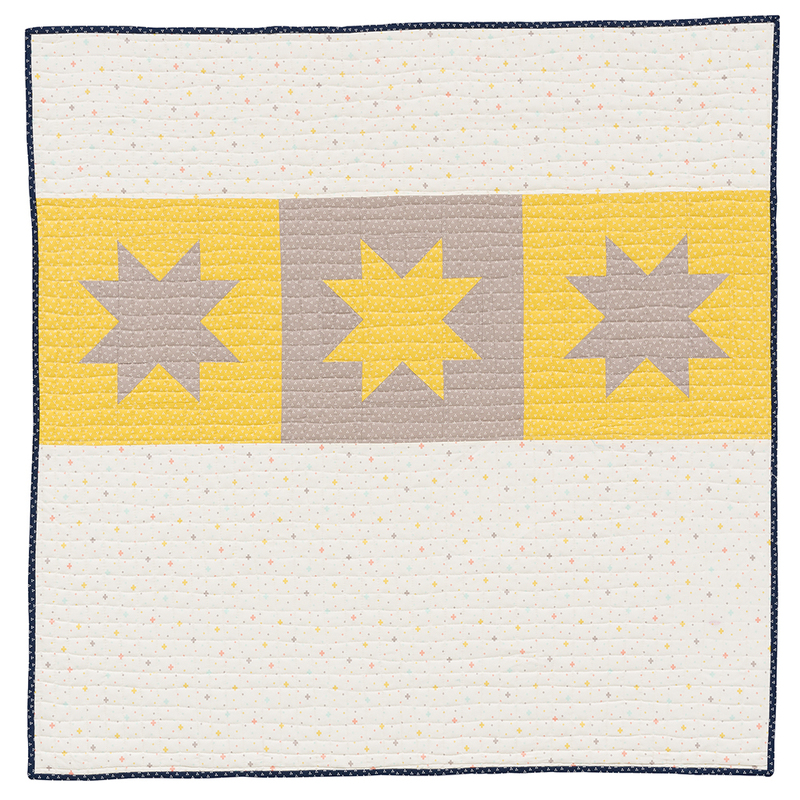 And it's perfect for beginners as the star can be broken down to some basic stitch and flip and a 9 patch. Easy as that!!! Which again, makes it great for the more experienced quilter to use it as one of those, "I have a baby shower tomorrow and nothing to bring" gifts that can really be put together in an afternoon. Just grab three fabrics from your stash and you are good to go!!! When it came time to quilt it, I again decided I wanted something that a beginner could do. So I quilted it with an all over grid pattern that is just as easy to do on a home machine as it is on a long arm. Just simple back and forth lines, that you can do with either a walking foot or a free motion foot if you like a little bit of wiggle in it, which I do ;) And goodness, talk about some yummy texture!!! And that is Time to Shine!! 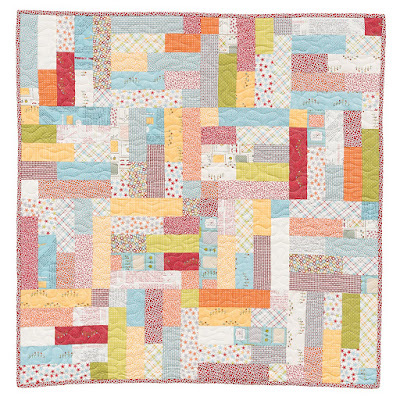 The quilt measures 45" x 45" just perfect for wrapping up some wee little fingers and toes and pudgy little cheeks. Oh, and I just love that you can turn this quilt any direction and it will give it a new look. There really is no up or down or side to side, and that just makes it all the more fun!!! There are lots of adorable baby quilts in this book and all are easy, fast, and so much fun to make!!! So be sure to Pop on over to Martingale, the book publisher, to see all of the beautiful quilts ;) And they just might be celebrating the release with a Giveaway as well!!! Good Luck!!! 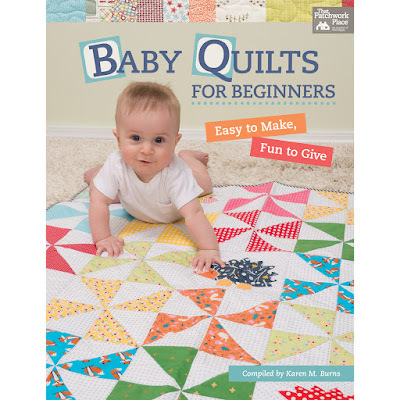 Baby Quilts for Beginners is now available wherever quilting books are sold and if you would like a signed by me copy, I have a few available in my little book shop here!! Delightful! Just perfect for the grandchild my newlywed daughter and son-in-law tell me is on their agenda :) So I'll be keeping these on MY agenda, too! 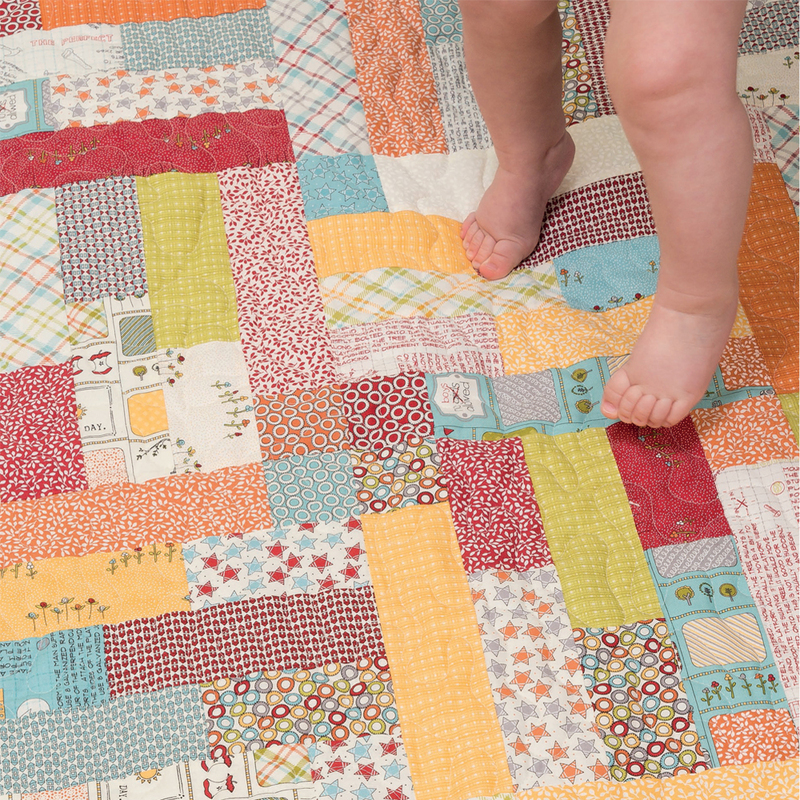 Love these quilts...and they are not just for babies! Perfect lap size for a quick gift, would love to have this! I love how happy you always sound! Thank you for boosting me up. The quilts are delightful. The second one with the three stars is giving me lots of ideas! These are fun and good for beginners. I like the star one a lot.